My family and I went to a tree lighting ceremony this weekend to celebrate the start of the holiday season. It was a joyous occasion filled with singing, smiles, and making memories. No money was spent, as it was free and we packed our own snacks to eat. As we were leaving my daughter saw someone selling light up glow sticks and immediately asked for one, to which I responded “no.” Two things happened immediately: She began to whine and I felt guilty. Why? Why do our children always seem to want more and why do I as a parent feel the need to give them more? I can satisfyingly say, in this case, I stuck to my answer, she calmed down and we left on a good note. Dave Ramsey’s suggestion of the Give, Save, Spend jar is a great way to teach our children the importance of money. Each time your child earns money, even as little as finding a quarter in the laundry or as much as $100 for Christmas, they divide it and put equal amounts in each jar. At the end of the month or a period of time, they use the money accordingly. They give to a charity, church, or nonprofit in need; they save and put the money in a bank account; they spend if they choose on those “gimmie” items. Children will begin to learn the importance of $1 and responsibility with spending as well as the pleasure associated with giving. Every day that we go to work, we earn money. Although doing chores are part of being a member of the household, teach your child the importance of hard work. Instead of using an allowance, use a “bonus” and surprise them with a dollar here or there or extra privileges for being a hard worker around the house. This way, things are not expected, but earned. 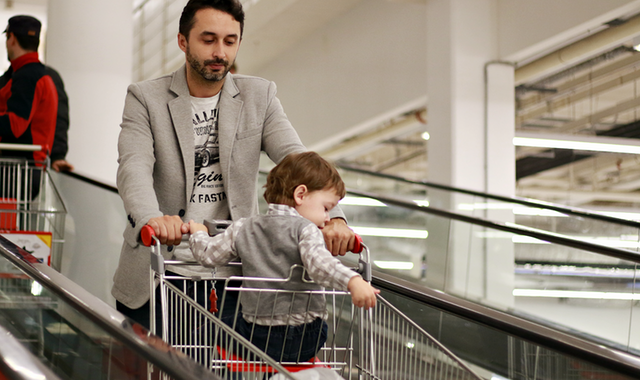 If you are out and about shopping with your children and they want that specific toy or snack, or they want to buy extra add on to the new video game, allow them to purchase it with their own money. If they have $10 in their spend jar, and they find that new toy worthy of $10, then let them have it. They will quickly learn what is and is not worth the money when it comes from their own pocket. If your child has earned money, or received gift cards for their birthday and it is burning a hole in their pocket to spend, sit down and create a budget with them. Let them look up all the items they want and put a price next to it. Using some basic math, allow them to add up the total and deduct it from their total amount they have to spend. Then begin the discussion about what is the most important or most wanted items on their list. Our children view most things as a NEED, and sometimes they learn this from us. Most of what we have is a “want.” Have the discussion with your child next time they ask for something about needs or wants. They will likely believe that what they want is a need because that is how they are feeling in the moment. Remind them they can use money from their spend jar for wants. Writing thank you notes is a great way for your children to show their gratitude for gifts or services. Even if your child is too young to write, they can send thank you notes. Your child can draw a picture and dictate to you what they would like to say in the note. We are all busy in our own way, but as a family find a way to give back a few times a year. Seek out a local animal shelter, nursing home, hospital, church, etc. and see what you can do to help. Maybe helping is cooking a meal or shoveling the driveway for an elderly or sick neighbor. Help your children learn the importance of giving and not receiving. How many times have we heard the story about the person who paid for the Starbucks coffee for the person behind them, and it kept going all day? It is such a wonderful gesture of giving to others and being grateful for the day. Teach your children the same. Give them an extra snack in their lunch to give to a friend, have them leave a note for the postman, or take a pizza to the local police station. Often we ask our children, “How was your day” and their response follows with “fine”, or something of that sort. Instead, ask your children to identify one thing that they are thankful for about their day, or one way they were kind to others. See if you could challenge their response so every day is different. The best way to teach our children is to model appropriate behavior. Show gratitude to your children when they listen to you the first time you ask them to. Show thankfulness when they clear the table after dinner or come home with a good school report. Model appropriate behavior when you check out at the grocery store or a person lets you in on the highway.